AOL 2452032: fantasy or reality? Today, I was suprised to read (online, newspapers) how many people started minimalizing the impact of the AOL searchdata dump. Let’s see if we can make something out of 1 random data dump. 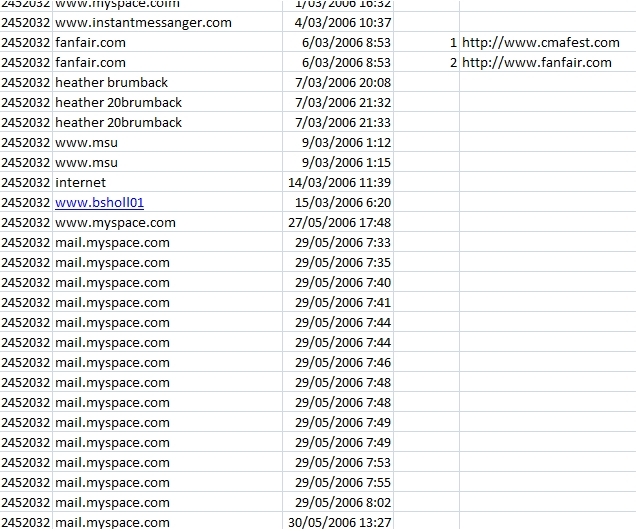 User 2452032 visits MySpace on March 1st and 27th of May. He searches for mail.myspace.com on the 29e and the 30e of may. Note: mail.myspace.com is only available for registered members. On the 4th of May the users types instantmessenger with an “a”. On the 15th of March, the users searches for “bsholl01”. This could be a login that has been typed in the wrong field (maybe you don’t do that, but I’ve already done it myself). User searches for “msu” on March 9th. He plans to study on the Central Missouri State University. So we have a Bxx Sholl (hit) who uses MySpace (hit) and AOL InstantMessenger (hit). He plans to go studying at Michigan State University (msu hit). I might have to much fantasy here. But from the data I’ve seen so far, I’m convinced users will be identified. That’s why all 658.000 users should be confronted with the data that has been given away by AOL. Just to make sure they can take action before someone else does. I’ll ask the MySpace Bxx if he wants to react. I hope he’s not too offended. Update 09/08: Ok, no fantasy. Thelma Arnold has been positively identified as an AOL user. I did send a message to MySpace Bxx (status: read). No answer.